Autumn is the perfect time for serving this pasta, either as the main course of a simple lunch or supper, or as the starter for an more elaborate meal. The pumpkin, walnuts and parmesan produce a comforting mix of flavors, while the lemon juice and cumin add zest. The recipe is quick once you’ve steamed the pumpkin, which takes about half an hour. Other forms of pasta, such as rigatoni or fusilli, may be substituted for the penne. And you can also choose between butter and olive oil to enrich the sauce. When mixing everything together at the end, if you happen to have walnut oil on hand you can substitute a teaspoon of it for the equivalent in olive oil. Another option is to mix in some chopped fresh herbs just before serving, and if desired (vegans please note) omit the parmesan. If serving this pasta as a main course, you could begin the meal with grilled Italian veggies and/or prosciutto, and follow with a salad of mixed greens, perhaps some cheese, and then fruit or a dessert, for example tiramisu. A hearty red would go well with the dish. Pare the pumpkin, cut into smallish chunks — no wider than an inch (2.5 cm). Remove the peel. Place in a steamer basket and steam until tender, about 30 minutes. Transfer the pumpkin to a large plate. Mash well with a fork. Add 2 tsp. butter or olive oil and mash again. Add the lemon juice and cumin. Sprinkle with salt and grind in some black pepper. Taste, and add more salt if necessary. Bring a large pot of salted water to a boil. Cook the penne until it is al dente, about 1o minutes. Drain through a colander. 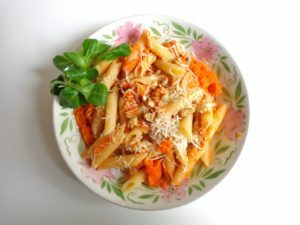 Combine the pasta, pumpkin and walnut pieces in a skillet. Add 1 tsp. olive oil or walnut oil. Heat through, stirring to mix well. Taste and adjust the seasonings as necessary. If adding fresh herbs, mix them in now. Serve piping hot in individual dishes. Sprinkle each dish with grated parmesan, and bring the extra cheese to the table. Serves 2 as a main course, 3-4 as a starter.